Thanks so much to Bob Fahey for finding the article and sending the text and pictures. (with Dennis and grandkids Kayla, 4 months, and Bryan, 7). A knock on the door in the summer of 1987 was the answer to Dennis and Donna Potts's prayers. 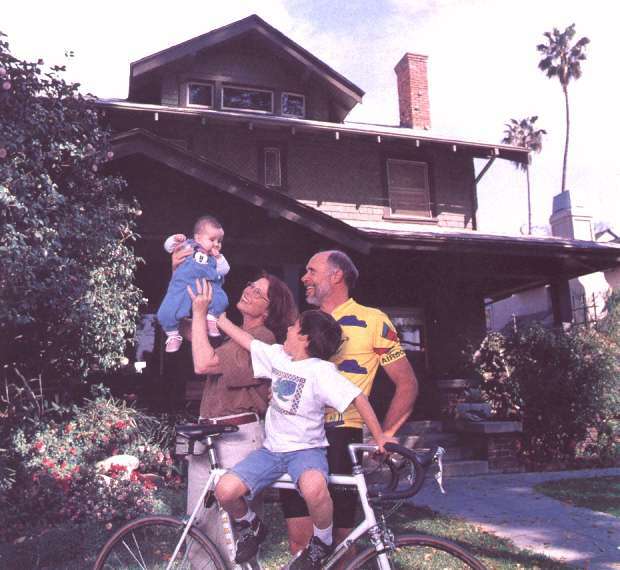 Short on cash for their son Don's first year of college, the Pasadena residents were preparing to refinance their home when a location scout for a new show called thirtysomething showed up. 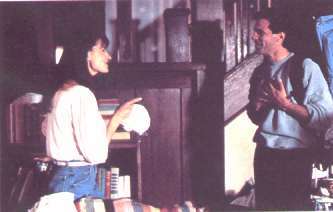 "We wanted an older house so we could have the characters (Hope, played by Mel Harris, and Michael, played by Ken Olin, below) do renovations," says designer Alexander. Seems the 95-year-old Craftsman-style house was a dead ringer for the kind of suburban Philadelphia home that characters Michael and Hope Steadman would live in. The producers offered the Pottses $1,500 a day to film their house. "The exact right time, the right amount of money," says Donna, 54, a high school biology teacher. "It was just what we needed." Much of the house's interior (above), including the fireplace, dark wood paneling and Mission oak decor, was reproduced on a set. Explains the show's production designer, Brandy Alexander: "The architectural style is popular on both the East and West coasts." The Pottses endured four years of a few grousing neighbors and film crews laying siege to their property, but that didn't spoil their taste for Hollywood. "If I'd known thirtysomething was going to be so successful, I'd have negotiated more money," says Dennis, 54, a spacecraft systems engineer. "But at the time, we thought we were in hog heaven."